Check out these sweeties at the fabulous Cider Hill Farm ! We were lucky to have Farmer Glenn right in the patch with us to answer all our questions. “Why did you become a farmer?” the young girl picking near us asked. 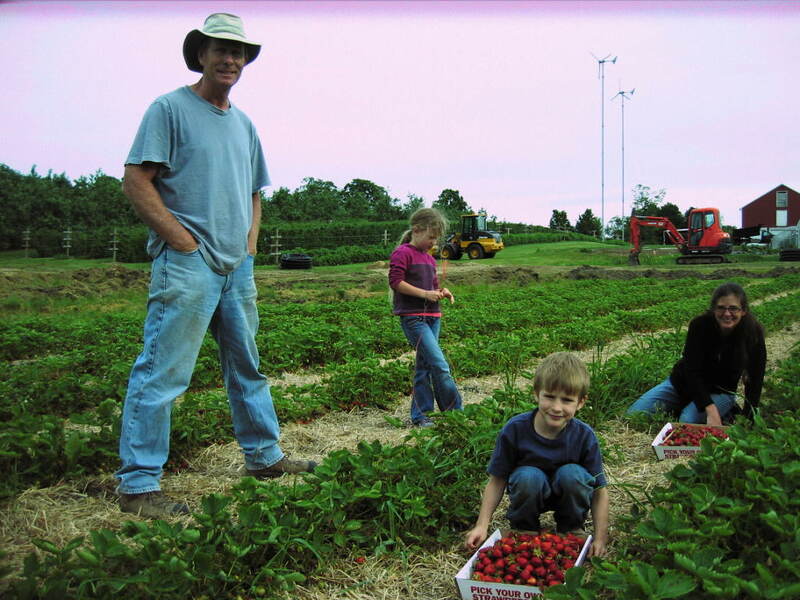 In business for over 30 years, Glenn and Karen Cook and Cider Hill started with strawberries and apples and now raise a whole host of summer fruits–many are pick your own–and a summer veggie CSA, too. With wind turbines and solar panels sprouting in strategic places around the farm, and greenhouses heated largely by the wood they harvest on site, they are almost totally independent of fossil-fuel based heating and electricity–ensuring a sustainable future for their part of our local food system. Makes us super proud to have Glenn’s late fall apples and award-winning cider in our Shared Harvest winter shares! “[Farmer Glenn] is really, surprisingly, very nice!” Quinn stated emphatically when we got home. Yes, Glenn had a surprisingly easy, optimistic air about him, born of the patience and long vision you get from (or need to have for?) a 30 year adventure bringing this same piece of land to such fruition, with New England weather that, he asserts, isn’t any more crazy now than it has ever been.